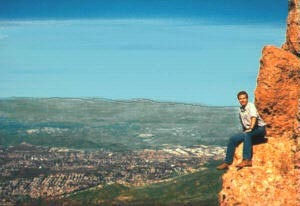 The mountains on one side of us comprise the Santa Monica Mountains National Park. The park is full of trails for hiking, biking and horseback riding. And the mountains are quite scenic, with interesting rock formations, waterfalls, caves, Indian rock paintings, and fossils. 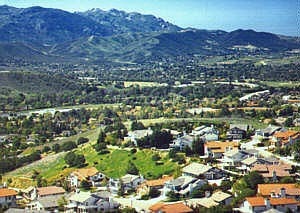 It's hard to believe that all of this is just outside of L.A. The amount of wildlife is surprising, including deer, mountain lions, bobcats, coyotes, and an occasional black bear. 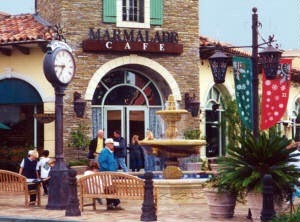 The city is designed with a lot of open space between neighborhoods to act as wildlife corridors. 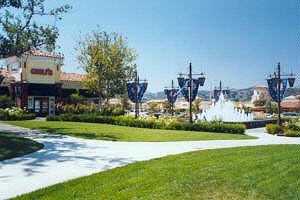 Thousand Oaks is one of those "master planned communities" that has actually stuck with the plan. The population is currently about 110,000, and sometime in the next decade we will hit the planned maximum of 130,000. For more facts and statistics about the city, check out the official city website. Because the master plan calls for slow, regulated growth, there are limits on the number of homes and businesses that can be built each year. Because of that, and because everyone wants to build here, the developers have to do more than usual to get their projects approved by the city. If a residential developer wants to build a housing tract, he has to provide roads, parks, schools, etc. 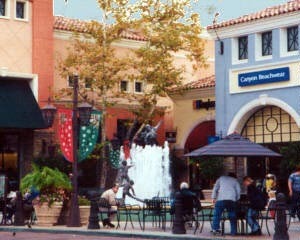 If a commercial developer wants to build a shopping center, it has to be artfully designed, and probably include things incorporated in the center pictured here: a fountain or two, outdoor sculptures, sidewalk cafes, valet parking, and music (usually broadcast through speakers, but live on the weekends).